Vintage - Valmont China of Japan, "Royal Wheat" Pattern - Produced in he 1960's. Total of (16) Pieces, as a Service for (4) Four. A gorgeous Contemporary Botanical Tea Set by Valmont China of Japan. Even though made in the early 1960's, this Royal Wheat Pattern is very much a part of the Love for Botanicals yet today. This has a Blue Wheat, Gray Leaves Pattern on beautiful Bright White Porcelain, with a Platinum Verge, Rim and Trim on Handles. Vintage - Valmont China of Japan, "Royal Wheat" Pattern - Produced in the 1960's. Total of (16) Pieces, as a Service for (4) Four. 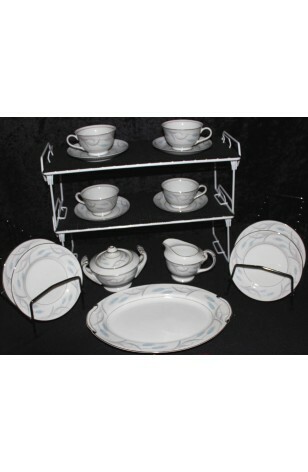 4 - Saucers - 5 3/4"
4 - Bread/Dessert/Tea Plates - 6 5/8"